This 9 day tour is perfect for those who prefer not to rush but to explore in depth the unmissable sights that the Kingdom of Jordan has to offer its visitors. The King’s Road and the crusader castle of Kerak, two days in the rose red city of Petra, a three day adventure in the desert of Wadi Rum guided by Bedouins and including jeep safari, accessible hiking and a camel trek. Visits to the Red Sea and the Dead Sea will also be part of this journey. Upon arrival at Queen Alia Airport, Amman, our representative will meet and assist you. Transfer to the hotel in Amman/Madaba for overnight. We travel along the King’s road to Mount Nebo with views over the Holy Land, the Dead Sea and the Jordan valley. Here Moses gazed at the promised land, and it is believed to be his burial place. We will then have a second stop at the Dead Sea, where you will have time for bathing in the salt waters at the lowest point on the earth. We continue to Kerak to visit the crusader castle and enjoy the view. You will have time to take lunch at the resthouse of Kerak, and then we go to Petra, where we will arrive in the evening. 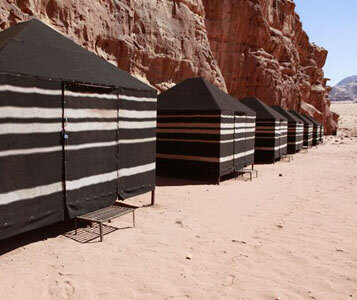 Overnight in a hotel in Petra, located close to the entrance of the site. Today you have a full day to discover the ancient Nabataean city of Petra, hewn from the red rose rock of the area, the jewel of Jordan’s archaeological heritage. The day includes a 4 hours guided visit with a professional and knowledgeable English-speaking guide who will accompany you down the Siq to the famous Treasury, also the Street of Facades, the Royal Tombs and Pharaoh’s Castle. You will also have free time to explore your preferred areas of the site – maybe the monastery or the high place of sacrifice, and you can take lunch at one of the several restaurants within the site. Overnight in Petra. Second day to explore Petra. You have the full day to visit in deep the nabatean city and hike away of the beaten path. After breakfast we drive 1.5 hours south to the mountains and valleys of Wadi Rum, one of the most impressive desert landscapes in the world. Here Bedouins still live in a traditional nomadic way, herding goats and camels and moving their goat hair tents according to the seasons. In a two and a half day tour, which includes a two hour camel trek, you will immerse yourself in the charm and peace of the desert wilderness, discovering its wide sandy valleys, narrow canyons and spectacular mountain views. The first day is a jeep tour of all the main places of Wadi Rum including ancient inscriptions, sand dunes, rock bridges and a canyon walk, You will also visit the house used by T. E. Lawrence during his time in the Wadi Rum desert. After watching a spectacular desert sunset you will spend the night under 1,000 stars in a private, secluded Bedouin camp. On your second day in Wadi Rum you will journey further to the south to the impressive mountain of Jebel Khash,where you will hike up to the summit and enjoy an amazing view above Wadi Rum desert and the Saudi Arabian border. After lunch you will walk through the stunning Nugra valley and then spend a second night dining on freshly-cooked, traditional Bedouin food and sleeping in comfortable goat hair tents in the Bedouin camp. After breakfast, you will meet your camel and camel guide and ride from the desert camp back to Wadi Rum village, a relaxing journey of around 2 hours through beautiful wide, sandy valleys. Following this we continue to Aqaba, Jordan’s premier Red Sea destination, to enjoy a day of rest and relaxation. Choose to shop in the duty-free economic free zone, relax on one of Aqaba’s golden beaches or go snorkelling at the Royal Diving Centre and discover the underwater wonders of the Red Sea. Dinner in Ali Baba restaurant, famous for its variety of local meals, especially the famous Sayadiyah, a speciailty of Aqaba, cooked with fish from the Red Sea. Overnight. You will be free to relax again in Aqaba, for example shopping or snorkelling. In the afternoon we transfer you to Amman/Madaba for overnight. Transfer to the airport at a convenient time for your flight. 3*-4* Hotel accommodation on BB basis.